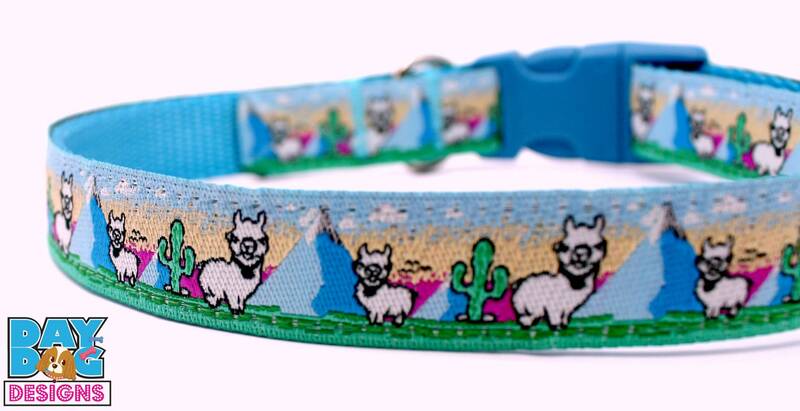 Cute and fluffy Alpaca Dog Collar. White Alpacas hanging out on purple mountains with saguaro cacti. This ribbon is placed on a heavy weight aqua blue webbing. Due to the width of this ribbon, it cannot be put on 5/8" webbing. *Pictured is a Medium 3/4 inch width collar. Only the 1" width will the color of the webbing be visible. If you purchase a 1 inch width collar they will be made as in this listing with ribbon layered underneath the ribbon as in picture #5.